The CTI 301-RB Mini-Grip Series control handle is a simple, inexpensive, compact control grip for applications requiring up to five AC or DC functions. Like all of our CTI control grips, our handles are backed with a lifetime guarantee. Fabricated from aluminum, our die cast, powder coated grips can handle the harshest environments. 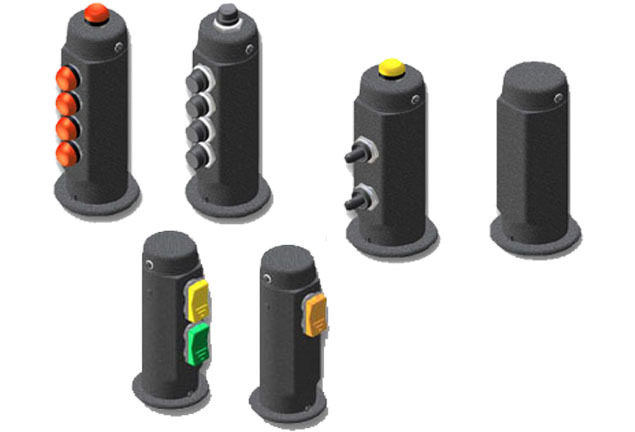 The 301-RB comes standard with SPDT momentary pushbutton switches and is available with up to four triggers and one thumb operated switch. It is designed for right or left handed operations, and the small compact shape is a comfortable fit for most operators’ hands.